Post and rung Shaker chair. Kentucky. I've sat in post and rung chairs from the Kentucky Shaker communities which were well over 175 years old. Visually stunning with their rich, complex patinas, (which stains can't even begin to duplicate), these pieces were also very functional, the joints surprisingly tight. Based on the 19th Century Shaker ladder-back chairs, Boggs’ chairs feature steam-bent slats and rear legs. The original Shaker ladder-back chairs used straight wood at 90 degrees to the seat: not ideal for comfort. It is a type of penance to sit in one for a long period of time. Boggs’ design, however, uses steam-bent rear legs to match the curve of your back for superior comfort. You can only steam-bend air-dried wood, not kiln-dried material. The moisture content of the wood needs to be between 12 and 20%--16% is ideal. The three slats in the back of the chair (always quarter-sawn material for the least amount of wood movement) are steamed for ½ hour at 200 degrees F and put in a form to dry. The rear legs are steamed for 2-3 hours, depending on the specie used. Steaming softens the wood’s lignin—the natural adhesive holding the wood fibers in the tree—allowing the leg to be bent in a form. When the wood cools and dries, it holds that shape indefinitely. Steam bending is superior to cutting curved parts from a large slab for two reasons. The first is aesthetics. 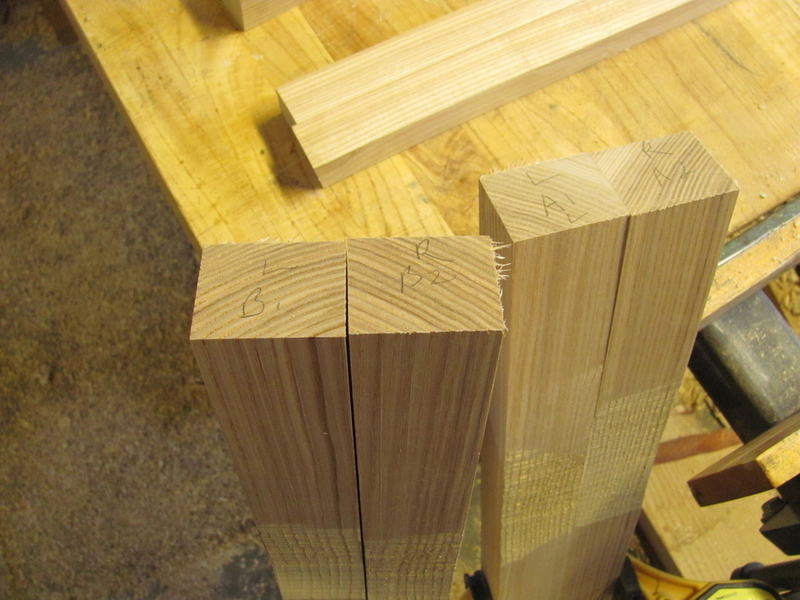 Below are rift-sawn ash rear leg blanks prior to steaming. The grain is approximately 45 degrees to the face of the blanks. Note how the grain is very straight in the blank and in the chair. You can trace the grain lines from the top of the leg all the way down to the floor. Why is that important? Well, you have both grain continuity and grain symmetry in both legs. A basic rule of furniture construction is to use straight-grain material for leg stock. Grain run out in chair-making parlance equals joining sentences with just a comma in English grammar. So you could say that grain run-out in leg stock is the run-on sentence of furniture building. Steam bending allows you to use only straight-grain, rift-sawn stock. If you were to cut out the curve in the rear leg on a large slab, you would have rift-sawn material and plain-sawn material in the same leg, resulting in grain run out. Factory furniture makers as a whole ignore this because of the costs involved (time, material), and they probably hope you won’t notice either. Arrow straight rear leg grain. Visual poetry. Second, in addition to aesthetics, there is a structural reason to use steam-bent, rift-sawn stock. I’ve sat in post and rung chairs from the 1820s in both Shaker communities in Kentucky. The chairs were still very functional with solid joints where rungs entered the legs. The reason was that the Shaker chair builders employed techniques to minimize the effects of wood movement through the seasons. That was the key: less wood movement means greater durability where the wood is joined. And rift-sawn stock with its 45-degree grain orientation allows the least amount of wood movement in the overall structure of a chair. For example, rungs enter the front leg posts and the rear legs at a 45-degree angle to the grain orientation (left). This is the best way to minimize the impact of wood movement in the overall structure of the chair. And that’s why chairs built this way have lasted generations! This was common knowledge for old-school Colonial and later Shaker builders. Brian Boggs uses these same time-proven principles in his designs. In addition to the above two points, the designer also relies upon chemical and mechanical bonds to increase the durability of the chair joinery even more. The rungs are dried to 4% moisture content in a special kiln. The 1 1/8 inch long by 5/8” diameter tenon end is first sized with a light coating of hide glue (sizing ensures glue is delivered to the joint and not squeezed out during assembly). Glue is reapplied to the tenon and mortise, and the tenon is inserted into the leg mortise, which has about a 12% moisture content. The glue provides a strong chemical bond between the tenon and mortise. But there is also a mechanical bond when the rung tenon swells slightly and the leg mortise contracts to reach their equilibrium (around 8%). It’s a kind of wet/dry assembly. It takes about 40 hours from start to finish to complete each post-and-rung chair (longer for arm chairs) because it’s a complicated process—milling, steaming and shaping by hand. 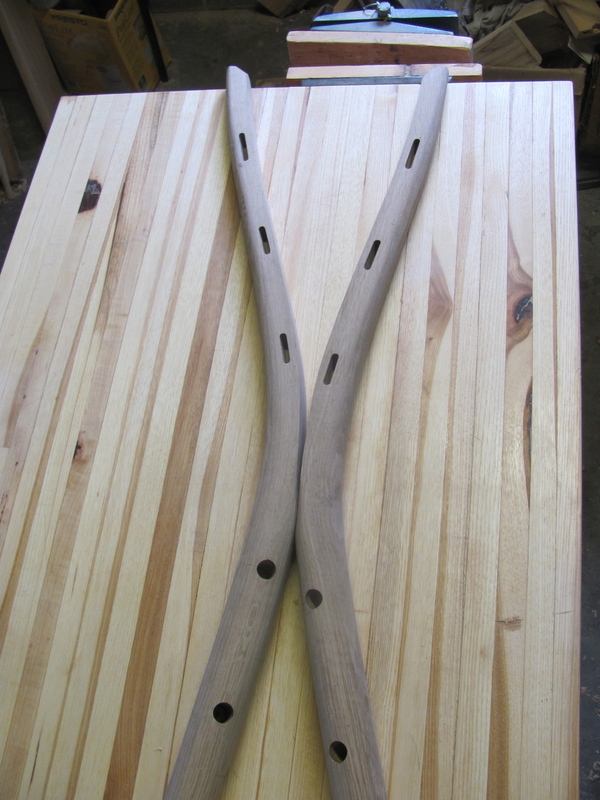 The legs are shaped (left) from square to round with traditional hand-tools: the drawknife and spoke-shave. There’s no other way to do it. The ¾-inch tenons in the slats are hand-fitted to the mortises, joined with hide glue, and pinned for extra strength. All this means you get a visually superior and structurally superior chair that will last generations. Creating the dovetail joinery in the Shaker-styled blanket chest (in the Bedroom link). Drawers from a Shaker dresser in the Pleasant Hill Shaker Community, Kentucky. Note the nice bead around the face of the drawer, with hand-cut half-blind dovetails to join the sides. This furniture is every bit as functional as it was when it was created, circa 1820-1850. All casework joinery is a combination of hand-cut dovetails and sliding dovetails. Not only are these superior in strength to, say, dados, they allow the whole piece to move seamlessly through the seasons while at the same time providing the authentic stamp of quality furniture. I try to have them exposed in many of the pieces, with thicker pins on chests and dressers and thinner pins on finer work such as drawers. Pins and tails, usually in a 1-7 ratio, are cut with a Japanese pull saw, and the waste is removed by a high-quality fret saw. Pattern routed dovetails have bulky pins with uniform, ho-hum tails. Their visual clumsiness disqualifies them for fine furniture. They are, however, excellent in kitchen cabinet drawers. Also, drawer bottoms and case backs are all solid wood, not plywood. It's just the way I like to work. A stunning Shaker blanket chest in cherry, again from Pleasant Hill, KY. The dovetails for the case are half-blind, instead of through dovetails which is more standard. Note the rich natural patina from 150+ years and the fine, delicate pins. The lid of the chest has dovetailed bread-board ends to keep the boards flat while allowing for seasonal wood movement. It looks like the front, sides and back are from one wide board.